WhatsApp Calling, the new invitation-only feature of WhatsApp that adds free phone call capabilities to the app that was previously only capable of messaging, has officially been launched. The feature can be accessed by users running WhatsApp version 2.12.10 or 2.11.528 from the Google Play Store, or version 2.11.531 if downloaded directly from the official website of WhatsApp. The rollout of the feature was first tested by WhatsApp in India early last month, with the feature then already tagged as an invitation-only. 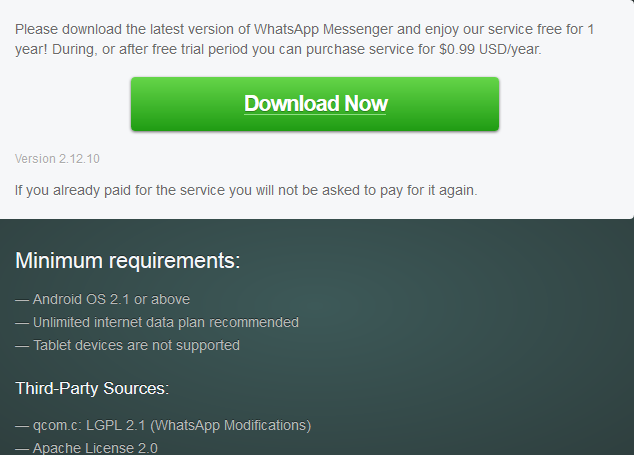 Users that wish to test the WhatsApp call feature first had to receive a call from another user to activate the feature, even if the user already had the latest version of WhatsApp installed. With the official launch of WhatsApp Calling, the process of triggering the feature to be activated is to receive a call from another WhatsApp user that already has the feature unlocked, showing no change to the process that was implemented for WhatsApp Calling's testing. However, if the user being called up does not have the latest version of WhatsApp installed, a notification will be sent to request the user to update the app before the call is made. According to Android news website Android Police, after a user receives a call from another WhatsApp user with the WhatsApp Calling feature already activated, the user interface for the app changes, either instantly or after the user closes and then re-opens WhatsApp. The new user interface displays three tabs, labeled as calls, chats and contacts. The call feature has been integrated well into WhatsApp, with the tab for WhatsApp Calling showing all incoming, outgoing and missed calls with their exact times. Calls that are ongoing are placed in the app's notification panel until the call is ended, and calls that are missed leave notifications that can later be checked by the user. While in a call, users can choose to mute their microphones or to turn on the loudspeaker. Accessing the call feature can be done through the messages with any of the user's contact, as a call button will appear as one of the options in the action bar for that user beside the attach option and the menu. Users that tap on the avatar of a contact will also be shown a profile image of the user that is bigger in size, with options of either sending them a message or calling them displayed, along with viewing their information. The call button for contacts now leads by default to a WhatApp call, as opposed to a smartphone call in the past.